If you’re looking for a top tier professional moving company serving Herriman, then consider Moving Connections. Moving Connections is dedicated to bringing the most professional local moving service to the Wasatch Front. With the best moving teams in the state, with a transparent and honest pricing plan, and with a bonded and insured service, Moving Connections has emerged as one of the best moving companies in Utah. And our rates are fair and honest. Since we are always striving to serve our customers, we have varying plans to fit different budgets for our residential moves. Our most popular service, however, is our Full Service Residential Move. Though this service costs more, it does give peace of mind to those who want everything to be done by bonded and insured professional movers. Our Labor Only Residential Move allows customers to do much of the work themselves. Our moving team still wraps and loads the truck, especially the large, heavy, and fragile items, but customers can pack many of the household items themselves. This saves you a lot of money since we charge for driving time, labor time, plus boxes and tape. We are also serious business movers. Whether you’re moving an office or a large corporation, Moving Connections has done it before and will coordinate with you to keep you up and running as much as possible even while you’re moving. 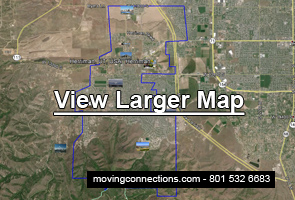 If Moving Connections is moving you to Herriman it's a perfect time to begin to utilize the many resources and bounties of Herriman. For example click on the picture to the left to go the Moving Connections 'Support - Advice - Assistance' page and discover Herriman for the first time. Once you are on the 'Support - Advice - Assistance' page go ahead and open the .pdf link found there and tape the list of emergency and useful phone numbers on your refrigerator. Moving Connections has gone to great pains to find those links and connections to integrate you quickly into Herriman life. If you’re considering a move to or from Herriman, there are a few things you should consider when selecting a moving company. First of all, you’ll want a company that is professional, with a proven track record. Moving Connections has been providing shipping and moving services for more than thirty years along the Wasatch Front. So we’re established here and we have a track record of excellence. Second, you’ll want the peace of mind that comes from working with a company that is covered. Moving Connections is bonded and insured in accordance with the requirements of its federal license. So we’re in business for real. Third, you’ll want an efficient, yet safe crew who will handle your household items with care. That’s why Moving Connections hires only seasoned professionals in the moving industry, not someone with no experience at a temporary agency. Moving Connections has handled business transitions from a small office move in the same building to a large multi-truck, mutli-crew, multi-day total corporate relocation. With experience like this, it’s easy to see why Moving Connections has emerged as a top flight local moving service in Northern Utah. We are in business, too, so we speak your language. You want to be up and running as much as possible. And for that reason, Moving Connections will carefully coordinate with you before your move to try to keep you up and running and while the move is taking place. Of course with the growing prevalence of mobile devices, that’s becoming more and more feasible every day.